You can’t mention Nicollette Sheridan without thinking of her most recent alter ego, Edie Britt of “Desperate Housewives.” However, when you watch Nicollette in her new Hallmark Channel movie, “Honeymoon for One” — which premieres Saturday, Aug. 13 at 9/8c — Edie will be the furthest thing from your mind. In “Honeymoon,” Nicollette plays Eve Parker, a woman scorned who decides to travel to Ireland on what would have been her honeymoon. Along the way, she discovers love in the form of the breathtaking countryside, a sweet preteen named Kathleen, and a handsome (and irksome) outdoorsman named Sean. Celebrity Extra: What brought you to the Hallmark Channel, and to this movie in particular, “Honeymoon for One”? Nicollette Sheridan: First of all, I really liked the character and I liked the movie. Hallmark is making beautiful movies that everyone can watch. And at times, they are dealing with slightly edgy material, so Hallmark has come a long way. And I do love that their movies are something the whole family can watch. CE: Tell me about your character, Eve. NS: Eve is hiding from herself and her intimate relationship by immersing herself in her work. I think a lot of people are guilty of that, and when something traumatic happens, she is forced to look at her life and make huge changes. And as we know, your career doesn’t wrap itself around you at night, and keep you safe and sound. Being present and being aware, and having a life filled with love, friendship and trust does. When you reach outside yourself and you do for others, it enriches many more lives, including your own. And that’s what I really liked about her journey. CE: What were some of the aspects of her character that you could relate to or that you were really proud of? NS: Well, she’s a very kind person, and she means well. Then again, she really needs to pull her head out of the sand and see what’s going on around her. And she’s a strong character. I like that she’s not a victim. It’s very difficult to go through a relationship breakup. Especially when somebody cheats on you, and though these things are very painful in her life, the outcome is a much better path. CE: It’s very exciting and brave of her to go off on her own to a foreign country to clear her head and decide what she wants to do with her life. NS: And it’s very out of character for her to do something like that, but her friends urge her to go. When she does, it’s very awkward at first, but she transcends all of that. CE: What was Greg Wise, who played Sean, like to work with? NS: Greg is a fantastic actor, and he’s very playful. We had a lot of fun shooting this film. CE: And the location was just gorgeous! Where did you film, and what was the actual filming like? NS: It was just stunning. We were in the most beautiful places. And I’d never been to Ireland, and coming from England myself, you have that expansive countryside, but it’s a much wilder feel in Ireland. I loved it over there. And of course I’ve been riding since I was a tiny little thing, and so for me to be out there and belting across the countryside on that white horse was heaven for me. It was just breathtaking over there. People are so nice and warm and friendly, and I’m looking forward to going back when I don’t have to work so I can really explore the country. 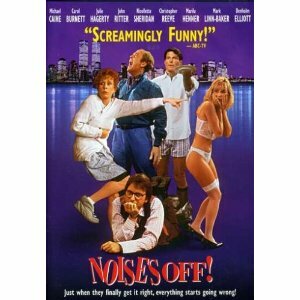 CE: A movie of yours that I absolutely loved you in was “Noises Off!” Do you hope to do some slapstick comedy like that again? Everyone in that movie was absolutely brilliant and I know you’re good at comedy. You’re good at the romance and the drama, but I just loved you in the slapstick, physical comedy. NS: Thank you. That was a very special movie. It had an incredible cast, and we would all convene at a roundtable in the morning, and everybody would tell stories and just share in a way that I’d never experienced on a set before. Basically we rehearsed it as a play. And then when we were ready to start shooting, we would shoot eight pages at a time, all in one shot. It was pretty demanding, physically, because as you remember, we were up and down the stairs and all the backstage business. The outtakes from that film were hilarious. I do love physical comedy as well as drama, so hopefully there will be a bit of everything to come. NS: I know! I just saw an ad for it. It looked exciting. There was a nostalgia that came with seeing the ad for the show, and I think the music and those faces that are so familiar to so many people … I think there is something comforting about it. And it looks exciting! You’ve got all those colorful characters, and I’m sure they are all going to do an incredible job with it. Larry Hagman looked great and Patrick Duffy, and I noticed that Brenda Strong, who was Mary Alice on “Housewives,” is in it. I’m thrilled for her, because she’s a beautiful actress and one of the loveliest human beings that I know. CE: If they decided to do a “Knots Landing” remake, would you be on board, or would you say, “Good luck, but my time on ‘Knots Landing’ has passed”? NS: I haven’t heard about anyone speaking of doing that. I think that “Dallas” was a lot flashier than “Knots Landing.” “Knots Landing” was really the down-home, simpler, more-pained version. Just very real people going through real situations, but I haven’t heard if they are interested in remaking that. CE: I know you’re involved with a lot of charities, especially animal charities. Can you tell me a bit about them? NS: It’s always wonderful to place animals in homes, because there are so many unwanted furry friends that need a beautiful family to go to. So, that’s something that I like to help with. Also, I got involved with Guide Dogs for the Blind. It is such a wonderful gift to be able to pair up somebody in need with a set of eyes and a companion. That was a very fulfilling thing to be a part of. Recently, there is this charity called Ride On that is with horses. It’s for the disabled — both physically and mentally, adults and children — and just through the love that you get through working with and riding horses. It’s an incredibly healing experience and gives them a sense of accomplishment to be able to ride and to be able to bond in that fashion. I’m going to have a little bit more free time coming up, so I’m actually going to get to be more hands-on with the people and the horses. Animals are such a gift.